French label Les Nouvelles Propagandes was founded in Tours during the eighties to release recordings by Minamata and his ex-members' new projects. 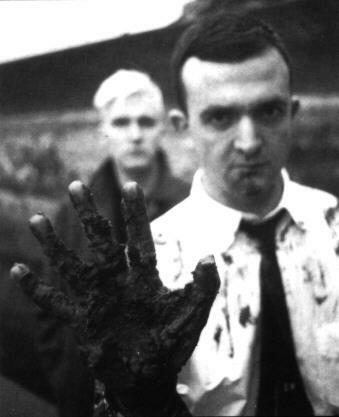 Minamata was one of the most radical industrial french bands of the eighties. They recorded three cassettes : "Mit Lautem Geschrei", "Methylmercure" and "Niigata 1964-1965" ; one more was released after their split, "Résiduels". After the recording of "Niigata 1964-1965", the three Minamata members (Marie, Tiburce & Xavier) disagreed about the musical orientation of the band and then decided to stop it. Tiburce created his mythical solo project La Nomenklatur, whose debut cassette, "La Légende Des Voix", was the first Les Nouvelles Propagandes release (and was later rereleased on CD by Ant-Zen). During summer 1989, Tiburce and Xavier reformed Minamata to record new material by request of a japanese label wanting to put it on LP, but that project failed and the new recordings were finally released as "Tomoko Uemura" CD by Les Nouvelles Propagandes. In 2007, "Niigata 1964-1965" was re-released on CD as "Niigata" by french label Nuit Et Brouillard with bonus material recorded in 2002. Jean-Yves Millet, the owner of the label and the man behind the one-cassette-only project Cent Ans De Solitude, is still selling some Les Nouvelles Propagandes releases here and here. Excellent as far as i feel a bit lazy for ripping my tapes. many thanxs for theses long time sold out releases !